Designed to relieve occasional or recurrent urinary discomfort and sensitivity. Reduces the risks of repeated infection. The nutrients in U-Tract Forte have been clearly shown to be effective at improving urinary health. They act synergistically to relieve occasional and recurrent urinary discomfort and sensitivity. Such urinary problems are generally the result of Escherichia coli bacteria in the bladder, or less commonly, Candida albicans type yeasts. U-Tract Forte's ingredients help to eliminate them naturally and reduce the incidence of urinary discomfort and sensitivity. - D-mannose, a simple sugar closely related to glucose, has been shown to be effective against the bacteria Escherichia coli, which is responsible for a large proportion of urinary tract infections. D-mannose sticks to bacterial adhesions eliminating them from the body via urination. - UTIrose, an extract of Hibiscus sabdariffa, has anti-bacterial and anti-fungal effects on E. coli and C. albicans, preventing and inhibiting bacterial adhesion. - CranMax®, a concentrated cranberry extract, helps reduce the frequency of urinary infections. A number of studies have demonstrated its health benefits for the urinary system. It contains proanthocyanidins which reduce the adhesion of certain E. coli bacteria to the bladder walls. - Bromelain is a proteolytic enzyme obtained from the stem of the pineapple. Its anti-inflammatory activity helps ease irritation and distension. Studies on cells and animals suggest it may destroy certain viruses and bacteria. - Extracts of orthosiphon or Java tea, and dandelion, have diuretic properties, and by increasing urinary volume, encourage the elimination of bacteria. 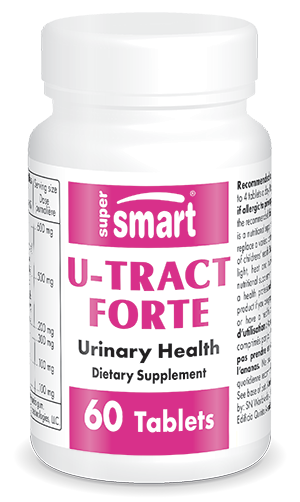 The synergistic action of U-Tract Forte's ingredients means greater efficacy against urinary problems. Together, they help prevent urinary tract infections, and reduce the risk of both recurrence and bacterial and fungal resistance. Adults. Take 2-4 tablets a day, or as advised by your therapist. Warning : do not take if allergic to pineapples.